I have a son who worked in a candy store. Later he worked in a toy store. It's like every kid's dream when they're little to work in a candy or toy store. Now he works in a motorcycle store. I guess that means he's growing up. He's a teenage twenty five year old. I can't really criticize since I work in a candy and toy shop for knitters. 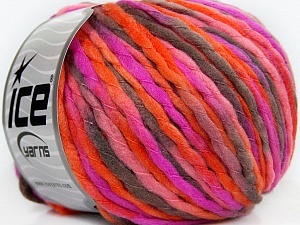 We have all kinds of toys for yarnies in beautiful candy colors. One ball is just not enough. You have to try out all kinds of different flavors and textures. It's like going through Willy Wonka's Chocolate Factory here. Lori is Willy, and Margaret, Anne and I are Oompa Loompas. Okay, I don't like that. Although I guess that means we get to break into dancing and singing about how to raise your children. Yeah, now I really don't want to be an Oompa Loompa. We generally avoid telling people how to raise their children. But we do encourage consumption of our candy! And if you're willing to join along, we could sing and dance. And we promise, no wild, crazy rides or squirrels that shove you down a garbage chute. We won't shrink you or stretch you or turn you into a blueberry. Your wild and crazy ride is entirely up to you and your knitting style. So for this week's sale - here's some candy. Seriously. A dollar! 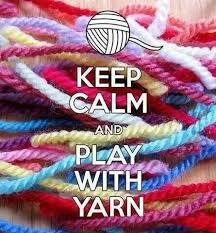 For a ball of yarn! This achievement acknowledges Manos del Uruguay mission of eradicating poverty through sustainable economic growth, enabling craftspeople to improve the quality of their craft products, so that, in this way, they can continue their personal development. We, the craftswomen, are the owners of Manos del Uruguay, and we are part of a non-profit Association, the objective of which is to generate work for rural women, allowing us to stay in our towns, earn our living and develop ourselves as human beings." So there you go. When you buy Manos yarns you help women support their families in Uruguay in places where they have little opportunity. Knitters and crocheters like to help people. They are earthly angels who spread socks and scarves around the world, throwing them gleefully out of handcrafted baskets while they sing and pirouette. . Many of these items hold prayers and love. 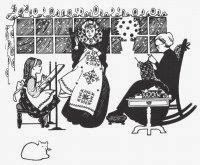 If artists were to draw yarnies they would need to add wings - knitted, of course, in fair isle patterns, elaborate cables, and assorted textured stitches - to the backs of these people. Halos would turn into elaborate crowns in crocheted lace. Most yarnies would wrinkle up their noses and roll their eyes at this imagery about them, but would have no problem bestowing wings and crowns on other yarnies. 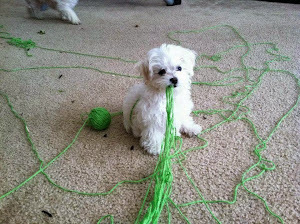 Yarn also likes to be made into useful things. 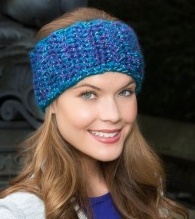 It knows that it is created to be a hat or scarf or a nice cozy sweater to warm someone. Our Wool Classica has been sad because it's been around for so long, just sitting and waiting for someone to take it home and love it and mold it into a thing of useful beauty. Posted by Anna Maria Junus (happy employee with tattered laughable wings and a broken halo and really wishes she could draw these angels as she envisions them). I mentioned before that I'm planning a move. There is a lot of stuff to go through and make decisions on. I'm not very good at that. There are people who become whirling dervishes and happily fling things into the garbage or giveaway, packing up what little they choose to keep. They can empty an entire house in an hour, dancing and getting a workout with enough energy afterwards to make a six course dinner and a floral bouquet. I am the kind that will have good intentions. I'll put on some music and even have a timer, promising myself that if I give it a good solid hour with no distractions I can reward myself with a break. Only I'll come across a journal, a book, or a stack of pictures, and I am off, looking, dreaming, reflecting. Two hours later I haven't gone any further than the book in my hand. That hour of solid organizing and packing can take all day and when I'm done I only have energy for a bowl of cereal. Unlike creating or making, reflecting requires something that already exists. Sometimes it's hidden away and only requires some light. It might need a mirror to truly see it. Sometimes all it needs is our memories. The baby blanket, the christening outfit, that cardigan that you wore everyday during college, the single mitt that lost its partner, the half finished cabled sweater you were in the process of making for the boyfriend long gone. The things we make today become the reflections we mull over later. I will eventually get the packing done. Usually I'll begin with good intentions of making time for it, taking my time on it, carefully packing things in an orderly way to make it easier to find later. Those good intentions often turn into last minute scrambles where everything gets flung into boxes and taped up without any organization at all. Clothes, my Kitchen Aid, and yarn could all end up in one box if it gets down to it. That's not what I PLAN to do, but based on my reflections of previous moves, it's what happens. And while I write this I have the old Supremes song in my head "Reflections of, the way life used to be..."
So here you go, A song stuck in your head and yarn that is reflective. We also have a couple of Lumio leaflets for more patterns. Posted by Anna Maria Junus (happy employee who really has to stop reflecting so much and start packing more). As I write this (Saturday) I am dealing with anxiety. Anxiety over a move to a place where I currently have no home or job. When is the best time to go out and find a place to live? How do I begin to find work? What if I run out of money? Will I have to live in a cardboard box and fight rats over the scraps behind restaurants? Anxiety over the actual move. What to throw out, what to keep, when do I rent a truck, what do I do with my stuff? Anxiety over cleaning. I hate cleaning. Mostly today, I am anxious over a play. The play I have been directing for the past couple of months opens tonight. I never feel this anxiety when I'm performing. But I'm not performing. My performance is done. The rest is up to the actors and technical people. I have no more control. As an actor I have felt the adrenaline rush. I get to go on stage and have fun. I have control over how I will play my part, how I will react, if something goes wrong, I can do something to save it. I can feel the energy from the audience and my fellow actors, and read their reactions and take my bows. As a director, there's none of that. I can only sit in the audience and watch. If they fall I can't rescue them. If mistakes are made, I can only hope that they'll cover them. If I've directed them one way, they still have the option to do it a different way. If they are wildly brilliant, it's because they are wildly brilliant. It is all in their hands now. I have no control. I have to completely trust them. I have no reason not to trust them and I do, but it doesn't ease this anxiety to know this. It just is. It's like parenting. You guide them, direct them, and then let them go, biting your nails and hoping that in spite of mistakes, and there will be mistakes, everything will turn out well anyway. If they are successful it is their success. If they fail it feels like your failure, even if it isn't. It is beyond your control. There's something soothing about knitting. You are always in control. 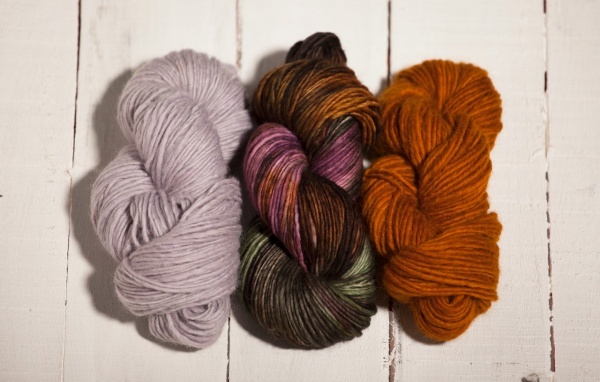 You choose the yarn, and how much you want to spend. You choose your pattern. You choose your tools. You decide when to knit and for how long. The repetition of the needles is like meditation. In circle out, in circle out, in circle out. 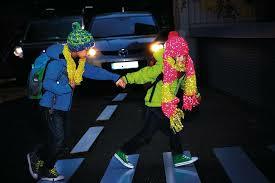 Your knitting gradually grows, taking shape, becoming something more than string. The clicking of the needles create rhythm. 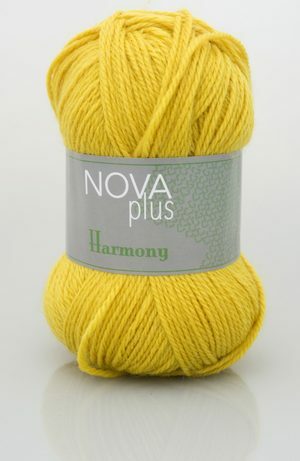 There is harmony between you and the yarn and the motions. You begin to understand how the pattern works. In circle out, in circle out. You may be watching TV or listening to music or a podcast. Perhaps you're praying or planning or problem solving as you in circle out, in circle out. If you make a mistake - and you will, you have options. Do I ignore it and carry on as if it isn't there? Do I decide to like it and repeat it throughout the piece, making it a design element? Do I fix it right here? Is it a quick little fix or major surgery? If it's major surgery can I perform it? Do I unknit it back? Or do I rip it out back to the problem knowing that I risk losing stitches? Do I rip it back all the way to the beginning and start again? Or do I decide to rip it back and abandon the project and use the yarn for something else? Do I just stuff the project in a corner to deal with later or not at all? Or do I do as a friend does, burn it or throw the whole thing out or give it away? What you decide in the end really doesn't matter. The world is not watching you. The world doesn't care. They haven't paid good money on tickets, babysitters, dinner and gas, got dressed up, and driven in a storm to come watch your work. They probably haven't hired you to do this. Neither your worth as a human being nor your pocket book is based on your knitting abilities. If you fail, that's only between you and no one, because even God has better things to do than worry about whether your lace is perfect and your socks match up. In a world where we are constantly measured and judged through work, school, community, parenting, relationships, our bodies, athletics, driving, our homes and pretty much everything we do, it's nice to have something where the only judge is us. In circle out. In circle out. In circle out. Posted by Anna Maria Junus (happy employee who is in circling out as she deals with anxiety and the fear of the unknown).